A thoughtful gift for those who are sentimental for their familiar stomping grounds. When it comes to your city, there are no limits to your love. 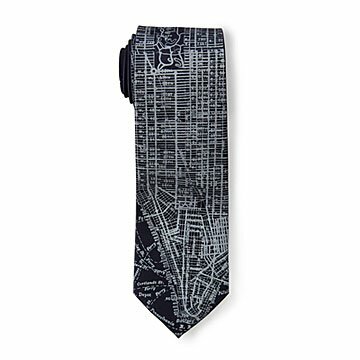 The patterns for these architecturally sophisticated ties are vintage maps, from a 1934 survey map of Los Angeles to an original map of Boston from 1814. Made from Microfiber with water-based ink, they make thoughtful gifts for those who are sentimental for their old or current stomping grounds. Designed by Bethany Shorb. Made in Michigan. Unique and good for a the special reason I bought it. Could of used a few more map details and a little tidier/cleaner print lines.